You can set up the default options for insurance claims. Note: Insurance claim defaults are location specific (each location of your organization has its own insurance claim defaults). On the Settings menu, under Production, click (or tap) Insurance Claim Defaults. The Insurance Claim Defaults page opens. 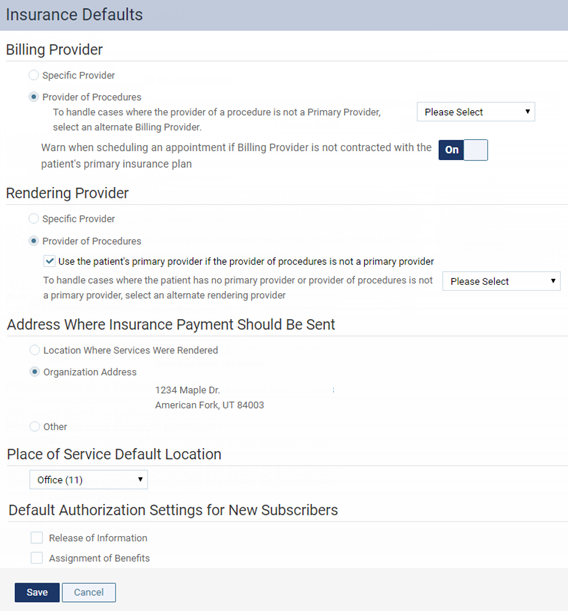 Billing Provider - By default, services will be billed to an insurance plan on behalf of a specific provider (select one), a location in your organization or a business entity (select one, if set up as a billing provider), or the provider who performed the procedures. If you select Provider of Procedures, to handle cases where the provider of a procedure is a secondary provider (for example, a hygienist), make sure that you select the primary provider, location, or entity that you want to use as the alternate billing provider. Rendering Provider Type - By default, services will be indicated as having been performed by a specific provider (select one) or the provider who performed the procedures. If you select Provider of Procedures, to handle cases where the provider of a procedure is a secondary provider (for example, a hygienist), make sure that you select the primary provider that you want to use as the alternate rendering provider. Address Where Insurance Payment Should Be Sent - The address where insurance payments will be sent: the address of the location where the services were actually performed, the address of the organization (the address used upon signing up your organization to use Dentrix Ascend; you cannot change this address), or another address (specify one). This address will appear in box 48 on claims. Place of Service Default Location - The default place of service for claims that get created. On a case-by-case basis, you can change the place of service for a claim as needed. Default Authorization Settings for New Subscribers - The default authorization settings (Release of Information and Assignment of Benefits check boxes) for subscribers who are added to Dentrix Ascend and have insurance attached to their records. Changing these options does not affect existing subscribers in Dentrix Ascend.